As thousands of illegal immigrant children are crossing the U.S.-Mexico border, House Democrats pushed for more amnesty, guest-worker visas, $3.7 billion in funding, and more lawyers for illegal immigrant children during a Tuesday Twitter town hall on immigration. 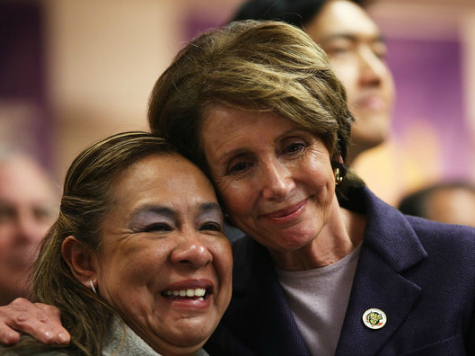 House Minority Leader Nancy Pelosi (D-CA), who has said she would rather pass amnesty legislation than become Speaker again, and Rep. Chris Van Hollen (D-MD) urged House Speaker John Boehner (R-OH) to bring an amnesty bill to the floor so it can pass with support from Democrats. Boehner told Obama after House Majority Leader Eric Cantor (R-VA) was ousted for his embrace of amnesty that Congress would not vote on an immigration bill this year. Boehner did suggest, though, that Congress could pass amnesty legislation next year. Reps. Tammy Duckworth (D-IL) and Steve Horsford (D-NV) pushed for more guest-worker visas, which are coveted by big-business and high-tech interests, that would lower the wages of American workers. Numerous scholars and studies have concluded that America has a surplus – not a shortage – of high-tech workers. Rep. Charlie Rangel (D-NY) insisted that amnesty legislation would “raise wages” even though the Congressional Budget Office determined that the influx of more foreign workers would lower the wages of American workers. For that reason, U.S. Civil Rights Commissioner Peter Kirsanow wrote a letter to the Congressional Black Caucus urging them to vote against amnesty bills that would detrimentally impact black Americans at the lower rungs of the economic ladder the most. At least 57,000 illegal immigrants have crossed the border since October of last year, and federal officials expect at least 150,000 more to do so next year. Obama has requested $3.7 billion in emergency funds from Congress to deal with border crisis.
.@TJones569 our overall visa process needs reform – H.R. 15 contains provisions to strengthen our workforce and help fix the system.